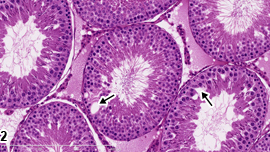 Testis, Seminiferous tubule - Vacuolation in a male Harlan Sprague-Dawley rat from a reproductive and continuous breeding study. 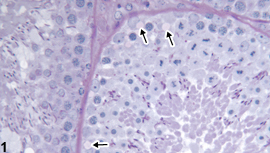 Vacuolation in basal Sertoli cell cytoplasm (arrows). PAS stain. Seminiferous tubule vacuolation can be microvacuolar or macrovacuolar in appearance. 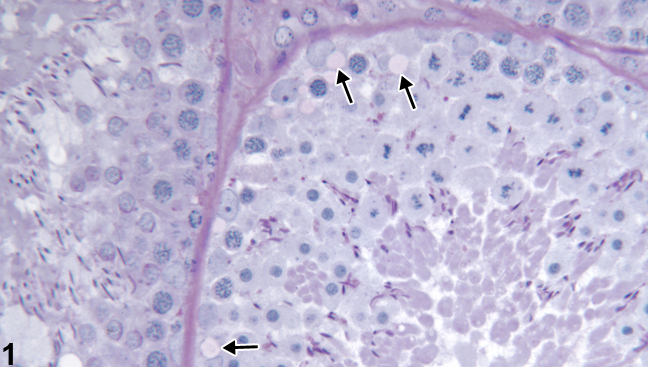 Microvacuolation generally occurs in the basal Sertoli cell cytoplasm ( Figure 1 , arrows), and macrovacuolation appears as one or a few vacuoles within the depth of the seminiferous epithelium ( Figure 2 , arrows). In most cases, the vacuoles are within or between Sertoli cells. They may contain fluid or lipid, or they may represent dilation of endoplasmic reticulum or intercellular spaces. Ultrastructural studies can be helpful to determine their origin. Vacuolation of Sertoli cells is a common early feature of morphologic injury to Sertoli cells that may be seen in studies of 28 days or less duration, prior to any germ cell degeneration. Alternatively, vacuoles often accompany generalized germinal cell degeneration/atrophy, where they probably represent spaces left by the missing germ cells. 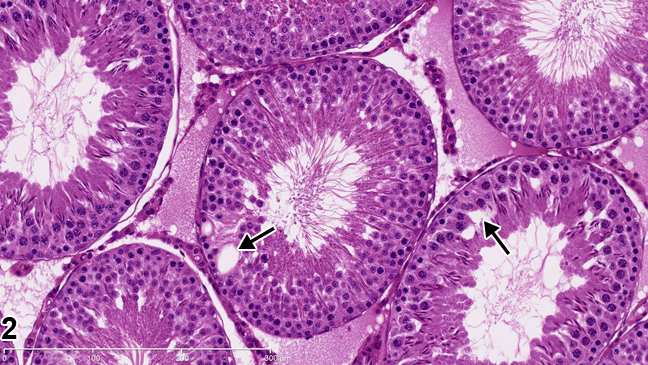 Vacuoles can often be seen as an incidental finding in occasional tubules in control testes ( Figure 2 , arrows) and may increase in incidence and/or severity over time. Seminiferous tubule vacuolation should be diagnosed and graded and should be discussed in the pathology narrative if the incidence and/or severity appears to be related to chemical administration. If present in both testes, the vacuolation should be recorded as bilateral and the severity grade based on the more severely affected testis. Hild SA, Reel JR, Larener JM, Blye RP. 2001. Disruption of spermatogenesis and Sertoli cell structure and function by the indenopyridine CDB-4022 in rats. Biol Reprod 65:1771-1779. Kerr JB, Savage GN, Millar M, Sharpe RM. 1993. Response of the seminiferous epithelium of the rat testis to withdrawal of androgen: Evidence for direct effect upon intercellular spaces associated with Sertoli cell junctional complexes. Cell Tissue Res 274:153-161.